Are you a dunker, a mixer or do you like to keep them separate? What we mean is when presented with a biscuit and hot beverage do you slam that biscuit straight into the drink, do you maybe mix a bit inside the mouth or do you feel the biscuit and hot drink should stay on their own? 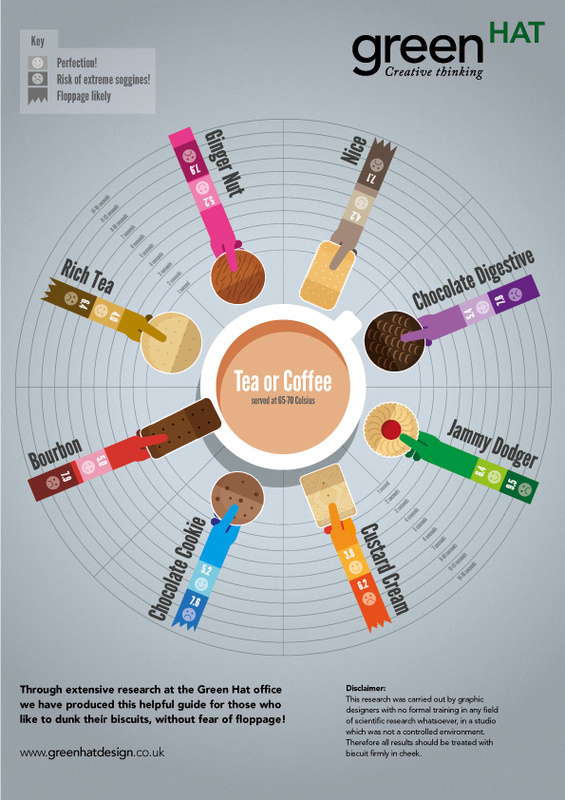 This fun infographic is aimed at those who love to dunk and was created by a curious designer over Green Hat Design. Using a whole mix of different biscuits the afore mentioned designer has built up some strong "scientific" research on just how long each biscuit should be dunked. 5.4 seconds for a chocolate digestive and 6.4 for the thicker jammy dodger, but be careful, dunk a dodger for close to 9 seconds and you'll be upset to watch the melted jam sink to the bottom of your cup.